Yes, you guessed, not some much a spelling test in the title but a play of words! 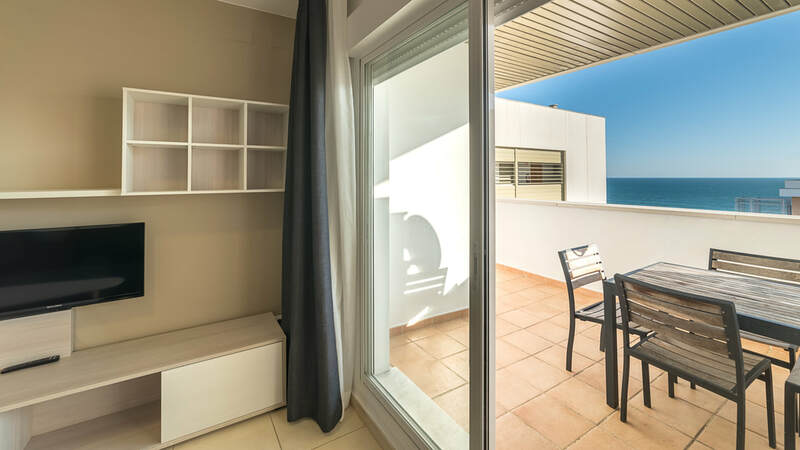 Our last point of call was the main hide overlooking the Laguna Grande where I hoped that I might be able to find the recently-arrived Bonaparte's Gull for the birding contact over here on holiday, Ted Mayhew, that had met me earlier in the morning whilst we were at the Wader Pool hide. Not only did we find the gull but as last week it was still in the company o a handful of Sandwich Terns. 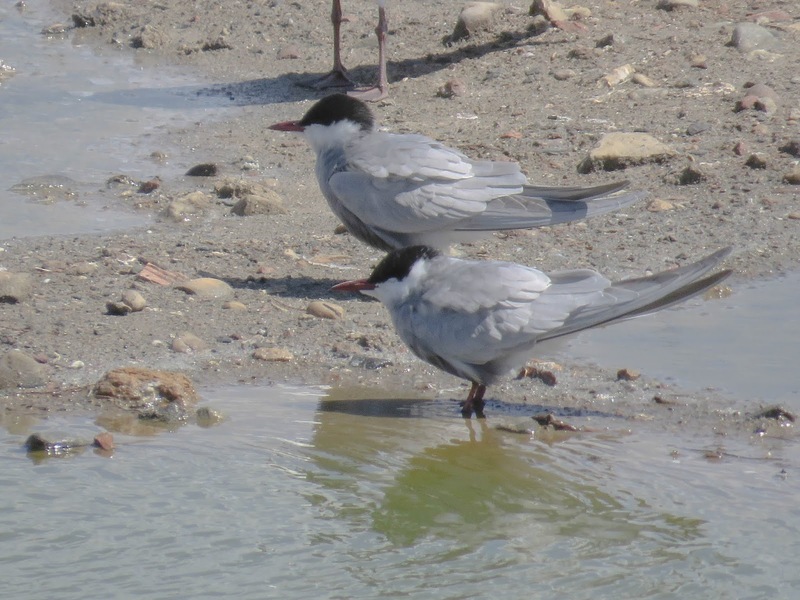 Then right next to the latter, a pair of Whiskered Terns. Whilst watching we also saw a flock of about 25 Whiskered Terns sweep as one across the water. And before they returned (re-terned?) 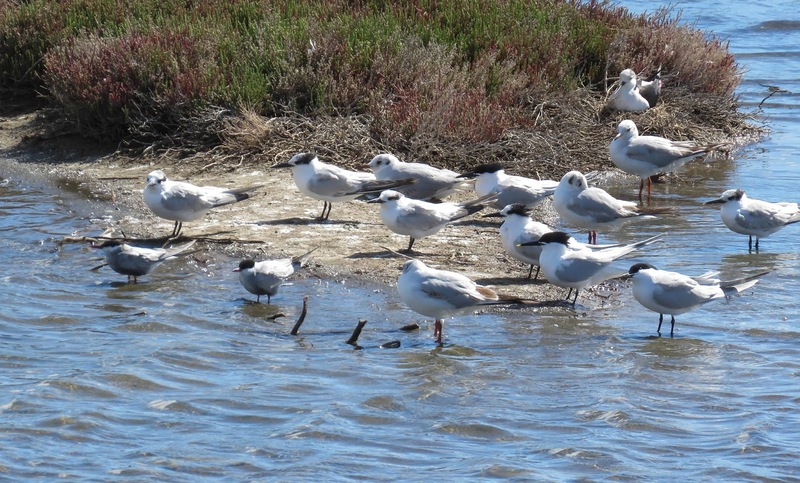 we had a single Gull-billed Tern join the happy throng on the scrape in front of us. What a turn up for the books which was quite a "tern on" for all three of us in the hide! Four Jackdaws as I approached the reserve and then nothing till I crossed the footbridge where I picked up a solitary Little Egret upstream just beyond the motorway and as I checked out this bird a pair of Red-rumped Swallows appeared on the scene to check-out the footbridge re a potential nesting site to which they might return. Real birding, however, started at the Laguna Casillas with a few Pochard, occasional Mallard and handful of Coot and a Moorhen. Perseverance also brought the Little Grebe to view whilst above me a mixture of Barn and Red-rumped Swallows along with a smaller number of House Martins. Serins in the nearby trees and just in time to see a large flock of Flamingo above the distant trees coming in, presumably, to land on the Laguna Grande - bu will they still be there in a couple of hours? Looking at the small movement below me in the tall grasses/reeds I was able to pick out my first Reed Warbler of the year but still no sign of a Nightingale yet. Just about to leave when a pair of Gadwall put in an appearance and on my walk to the Wader Pool I had a distant view of one of the local Booted Eagles. The Wader Pool produce almost fifty Black-winged Stilts along with a couple of Little Ringed Plover. Half a dozen Redshank were busy feeding along with a single Common Sandpiper and a passing Goldfinch. 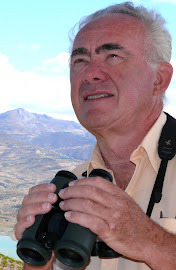 By the time the Spotless Starlings and Monk Parakeets had made their presence know I was joined by a visiting birder, Ted Mayhew from Chichester who was presently holidaying in Fuengirola. Good to have Ted's company for the rest of the morning and help in find a few more species to add to his growing list. 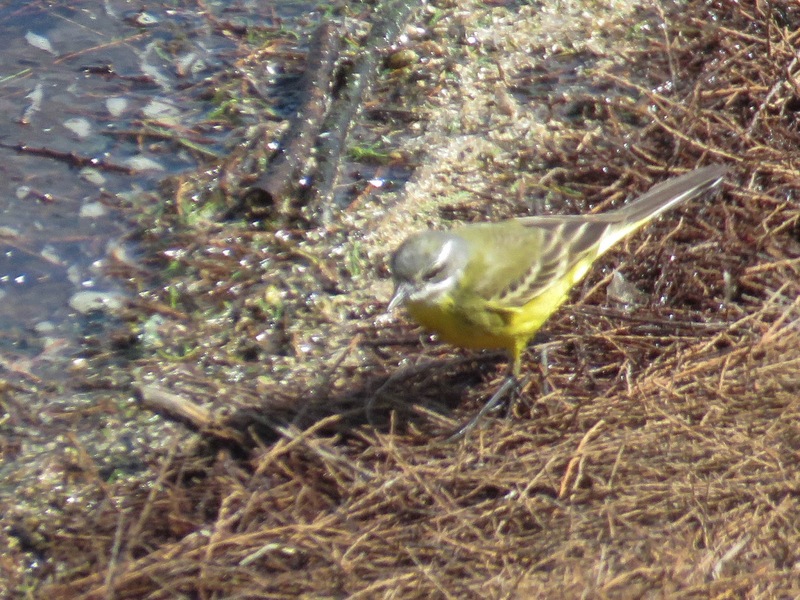 The walk to the Sea Watch brought up a pair of Greenfinch on our right along with a couple of Sardinian Warblers. A Crested Lark was foraging on the rough ground to our left and then we stopped to check out the Rio Viejo (Old River). Again, at least fifty Black-winged Stilts (which made it well in excess of 100 when adding all sightings together) along with a good number of small plovers, mainly Kentish but also a number of Little Ringed Plover. 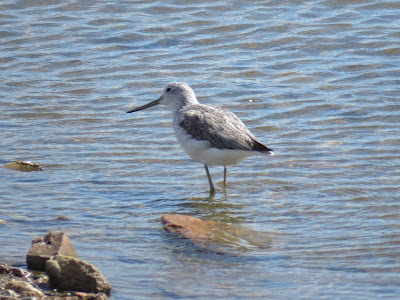 A single Greenshank was feeding at the far (inner) end of the water and use of the scope produced a dozen Sanderling at the sea end of the old river. On the water itself, a pair of Shelduck and a dozen or more Avocet were a delight to see. A pair of Collared Doves flew past as we continued on our way whilst checking the distant bird found a Woodchat Shrike sitting patiently on a fallen tree waiting for lunch to arrive. A male Blackbird arrived close by and a few more Goldfinch before we made our way back making our next (staying) stop at the Laguna Escondida. Just three White-headed Ducks to be seen at the far end along with both Mallard and Pochard plus a couple of Moorhen. But to my immediate left in the small, bare tree a trio of Bee-eaters, my first sighting of the year, along with three Herons resting on the grass behind them. More Crested Larks and Sardinian Warblers as we made our way to our final stop at the Laguna Grande where the cover of the main hide enabled us to take a closer look at the "white" birds gather in front of us. 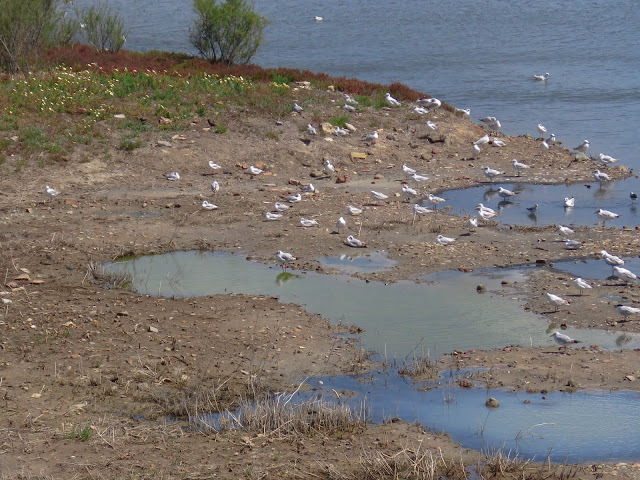 Mainly Black-headed Gulls Gaviota Reidora Larus ridibundus but what else? Whilst plenty of Black-headed Gulls I was still able to find the recently-arrived Bonaparte's Gull along with up to a dozen Slender-billed Gulls. Again as on my last visit, there was also more than a handful of Sandwich Terns. However, on this occasion I also had a couple of Whiskered Terns resting alongside their cousins. Just when we had begun to enjoy the new arrivals a close-knit flock of a further 25 Whiskered Terns flew across the water and out of sight. Presumably active migration taking lace. 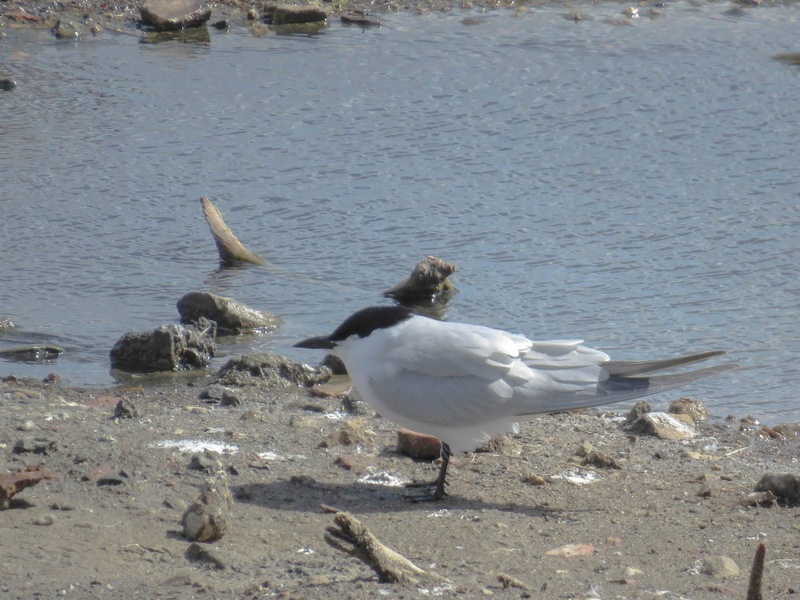 At first glance I thought one of the Sandwich Terns had moved even closer and was now resting immediately in front of me when I saw its stubby bill and increased size and realised that we had a third tern specie present with the arrival f a single Gull-billed Tern. Could it get any better? Well, yes, if you include finding the flock of 44 Flamingos previously mentioned above. 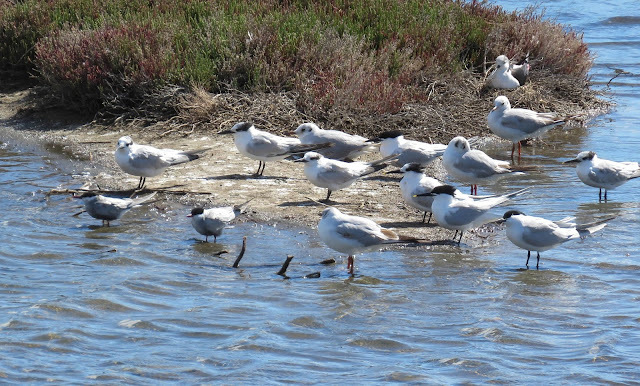 The whole group looked very sleepy with none feeding so, again, I suspect a flock of passage birds. Only two Cormorants on site but I did see three further Blue-headed Yellow Wagtails with one feeding immediately below the hide. 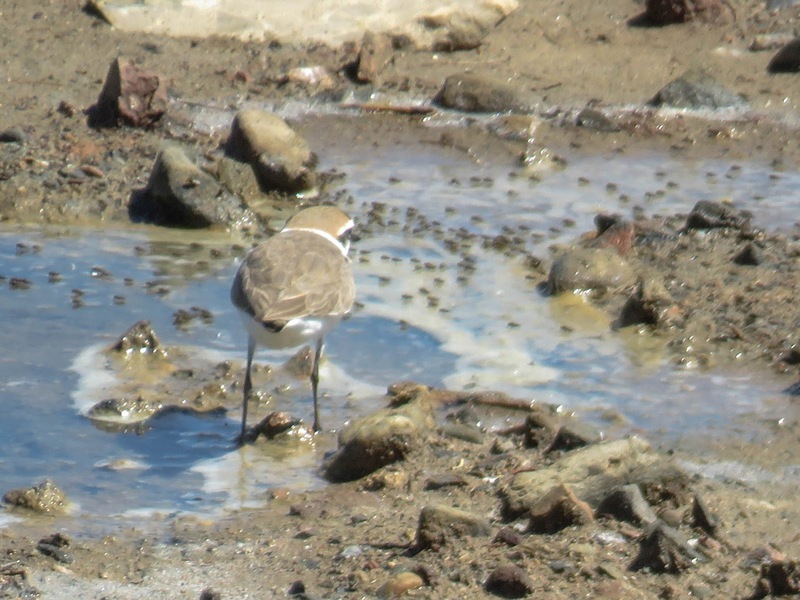 Then, apart from more Kentish Plover, a group of four waders foraging around the water's edge doing their best not to be identified and had, by now three of us checking various Collins' Guides. 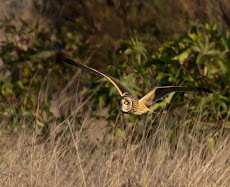 The white spotting on the back was so clear but more difficult to clarify the head markings. 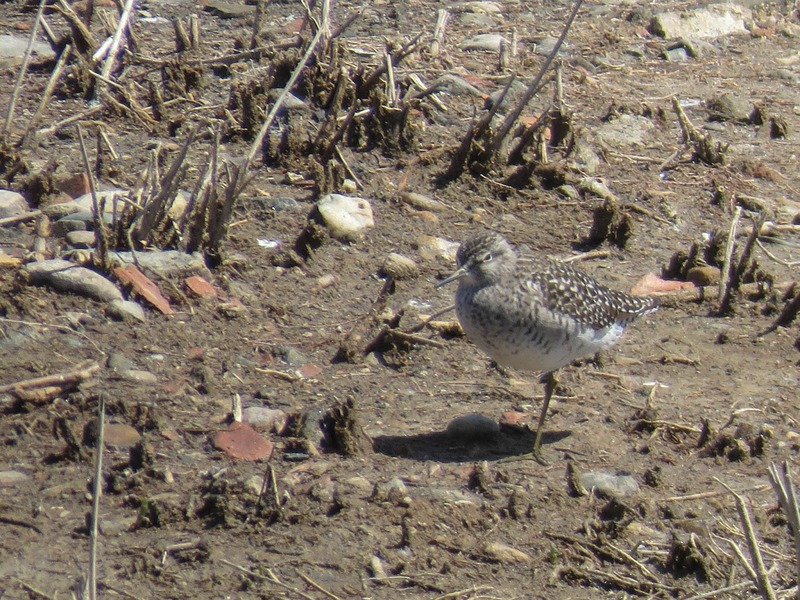 But, in the end, no doubt that the birds were Wood Sandpipers and so a fourth new bird for the year in one morning. And with that it was time for me to drive home and get on with my medication - but I will return, as somebody once said, especially if I can record another 50+ species in morning. Shelduck, Gadwall, Mallard, Pochard, White-headed Duck, Little Grebe, Cormorant, Little Egret, Heron, Flamingo, Booted Eagle, Kestrel, Moorhen, Coot, Black-winged Stilt, Avocet, Little Ringed Plover, Kentish Plover, Sanderling, Dunlin, Redshank, Greenshank, Wood Sandpiper, Common Sandpiper, Black-headed Gull, Bonaparte's Gull, Slender-billed Gull, Gull-billed Tern, Sandwich Tern, Whiskered Tern, Collared Dove, Monk Parakeet, Bee-eater, Crested Lark, Barn Swallow, Red-rumped Swallow, House Martin, Blue-headed Wagtail, Blackbird, Reed Warbler, Sardinian Warbler, Woodchat Shrike, Jackdaw, Spotless Starling, Serin, Greenfinch, Goldfinch.